Please feel free to contact these customers via their website if you want to ask for references. Creating a website with Tuttiwebs was very easy and the final product really exceeded my expectations. Brian's attention to details and professional advice was really appreciated along the way and I can only recommend the services of Tuttiwebs. Brian delivered a timely project and on a reasonable budget. My new website is a great tool and has really helped me already to market my services effectively. "I have just enlisted Brian Farrell's aid in setting up a website - www.raymonddeane.com. The result is so satisfactory - to put it very mildly - that I suddenly realise how advantageous it would have been for me to have done this years ago. The site has only been public for a few days as I write, yet I've already got an overwhelmingly positive response. I'll be recommending Tuttiwebs to any colleague who asks me." "I am thrilled with my new website by Tuttiwebs. Each one of my many requests was dealt with patiently and efficiently, nothing was too much work and the overall result is better than I had hoped for. Aesthetics and technicalites are given the perfect marriage and the fact that I can update most of the pages myself is the icing on the cake! 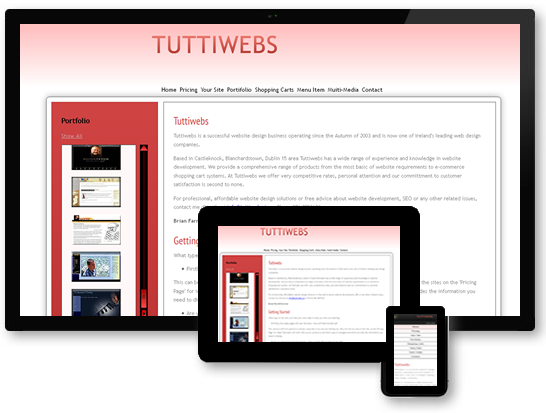 I would not hesitate to recommend Tuttiwebs to anyone who wants an affordable website quickly." HEY! This site is fully Responsive and Mobile-Ready! What does that mean? Well why not try it out on your phone and see for yourself. It will 'respond' to whatever device you view it on and you won't have to enlarge texts or images to read them however small the device.